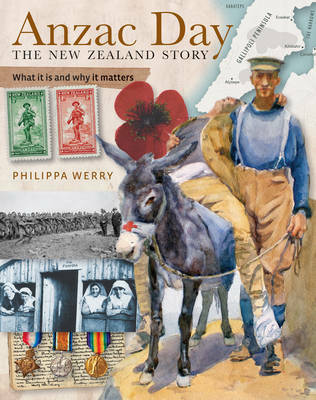 "This book exposes the rich history behind Anzac Day, seeking to answer the many questions children often ask their parents and teachers around the 25th of April every year. It covers all aspects of Anzac Day, from the Gallipoli Campaign and the Great War, right through to the fo... read full description below. Aimed at 8 - 12 year olds but useful for the whole family, this fascinating new book exposes the rich history behind Anzac Day in an engaging and informative style, seeking to answer the many questions children often ask their parents and teachers around the 25th of April every year. It covers all aspects of Anzac Day, from the Gallipoli Campaign and the Great War, right through to the format of the commemorative services held annually throughout the country. The author identifies important memorials around New Zealand, examines the national anthem, the tradition of Anzac biscuits and the Last Post, Reveille music, plus much more. She also offers websites and projects for further study. The thoroughly researched information is presented alongside numerous images, both historic and contemporary, giving children a very clear view of the significance and background to Anzac Day. Philippa Werry is a librarian and children's writer whose non-fiction, poetry, stories and plays have been widely published. Her work has appeared in the School Journal and other educational publications, and some stories have been broadcast on National Radio. The Great Chocolate Cake Bake-off was included in the Storylines Notable Books List 2008, and Enemy at the Gate has been shortlisted in the Junior Fiction section for the NZ Post Book Awards 2009.